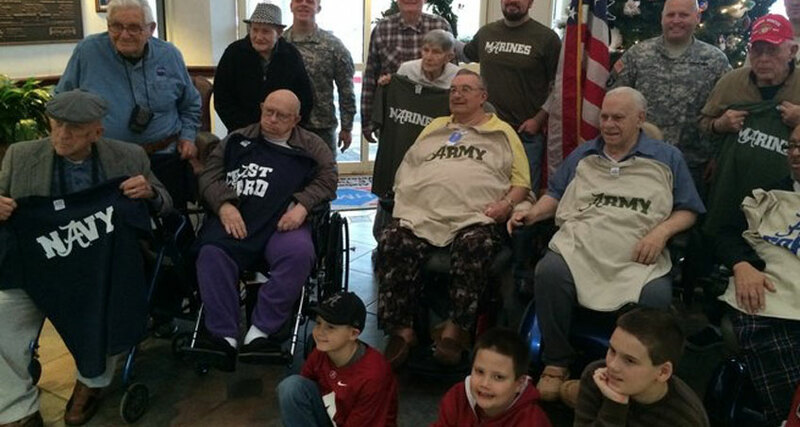 Home / Posts tagged "Living Environment"
Veterans at Tut Fann State Veterans Home received donated military t-shirts featuring the script Crimson Tide A. All across the area, residents took time Tuesday to honor those who served our nation on Veterans Day. At Bill Nichols, the ceremony began as the Alexander City Honor Guard posted the colors and conducted the parade of service flags. Alexander City City Councilman Tony Goss said being at Bill Nichols makes him imagine the feats accomplished by the the Veterans in the crowd. “When I am here, I take a step back and turn my imagination on,” Goss said. “I take a look around the room and visualize the things that you all saw and did. I see the helicopter pilots who flew combat missions and helped save our wounded. I see you all fighting in the trenches for our freedom. Ms, Alabama Nursing Home Edna Farrell served in the Army Cadet Corps and recalled helping soldiers and outlined how her family had served. Mayor Charles Shaw said he was honored to be in the presence of so many people who served their country so bravely. “It is a great honor to be here to thank you for your service and for what all of you have done for this city, this state and our country,” Shaw said. Garette Woodham, administrator of Bill Nichols State Veterans Home gave the final remarks of the ceremony. Three residents of the Bill Nichols Veterans Home competed in the Alabama Nursing Home Association’s Senior State Games Friday in Birmingham. This is the first time nursing home residents have been able to participate in the Senior State Games, designed for ages 50 and older to stay active and healthy. 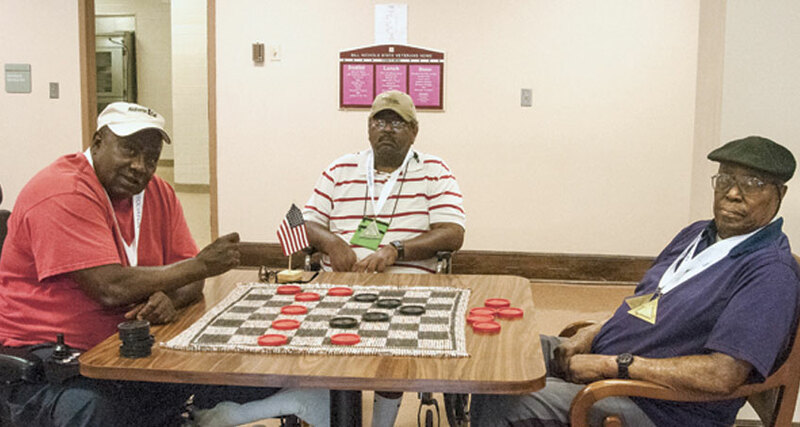 The nursing home residents competed in checkers, dominos and bocce ball. “It’s a good way for seniors to be able to practice using their muscles and hand eye coordination,” said John Matson, director of communications for ANHA. Charlie Boswell, Calvin Hall and Roger Thornton from Bill Nichols each earned an award competing in the games. Special medals were minted for seniors competing in the Senior State Games this year. Boswell and Thornton competed in checkers for their age groups, winning gold medals for their outstanding skill. Boswell also went on to compete against all participants in the checkers group, and won a gold medal in the overall group. Hall competed in the 60 and up age group for competitive dominos, and brought home the silver medal in his age group. The ANHA Senior State Games is a partnership with the Alabama Department of Senior Services (ADSS) and the Alabama Sports Festival (ASF) Foundation. The games coincide with the ASF Foundation’s 32nd annual Alabama State Games. The Alabama Nursing Home Association is a title sponsor for the senior games as they kicked off their first year. There are a total of 13 competitions for the Senior State Games including swimming, table tennis and shooting sports. On May 26 I was privi leged to attend the “Raising of the Flag” ceremony at Colonel Robert L. Howard State Veteran’s Home in Pell City. What a way to begin Memorial Day. Standing in the morning light surrounded by vet erans, I now more fully appreciate the meaning of Memorial Day. Much like Christmas, it is easy for us to become focused on the activities and traditions; not the real reason for the holiday. Before 5:30 a.m., veter ans, dignitaries, a few fam ily members and the staff of the home started lining the walkways in front of the building. They were there because they wanted to participate. It was not a requirement. The ceremony was sim ple and brief: the playing of TAPS; the presentation and raising of the United States flag to half staff; fol lowed by the presentation and raising of the flag of Alabama to half staff. Veterans made their way or their wheelchairs were pushed back into the build ing. A procession of true American heroes. Many carry memories of fallen comrades and the ravages of war. Inside the main sit ting area had been deco rated. Veterans were seat ed around tables and the Home staff served break fast. Every employee was busy serving plates, refilling drinks, making sure every one had what was needed. Some were even assisting veterans with eating. Twenty-four nursing homes from across Alabama have been nominated for the 2014 Alabama’s Best Practices Program. The nominated nursing homes have developed innovative ways to improve the quality of care or quality of life for nursing home residents. Each nomination will be evaluated by a panel of health care professionals using 11 specific judging criteria. The top eight nursing homes will present their best practices at Alabama’s Best Practices Program. The remaining nursing homes will display their best practices in a special exhibit hall. The 21st annual Alabama’s Best Practices Program will be held August 28, 2014, at the Cahaba Grand Conference Center in Birmingham. PELL CITY – Twenty-four soldiers from the American Revolution throughout history to the present stand as an honor guard at the Col. Robert L. Howard State Veterans Home. The painting by Dean Mosher, “A Grateful Nation Remembers,” was unveiled Thursday, where it will remain on permanent display. Marsh said it was an honor for him to serve in uniform and in his current position. Marsh said while in south Alabama, he spoke with an architect about the need for a work of art to pay tribute to those who gave service. Ken Rollins, Chairman of the Homes Committee for the Alabama State Board of Veterans Affairs, said every veteran wrote a blank check to the United States of America offering their lives for their country. “We couldn’t have put this in a better location than Pell City in St. Clair County,” he said. Mosher, who has historic paintings in museums and public buildings across the country, said he comes from a long line of veterans who served in the American Revolution and have fought in virtually every conflict since. Mosher said the 8-foot-by-14.6-foot canvas took nearly a year to paint. Mosher said he used people, soldiers and sailors, rather than machines. George Crumley once wore a uniform, and was part of an effort to defend his country on foreign soil. Because of his service and her heart, Donna Blackston stopped as soon as she saw him walk to the door of the nurses’ station. Immediately, her attention was directed to him. He was the main person in the room. She asked him to dance with her or maybe sing. “Oh, how he can dance,” Blackston said, holding on to Crumley. Crumley had a different idea, though. He did not come for a dance. He came for a hug and a cup of ice cream. After sitting him in a chair, Blackston obliged his request. She asked one of the nurses, Lacey Saylors, to heat it up for seven seconds in a microwave so it would be soft enough for him to scoop out with a plastic spoon. As he waited for his ice cream, he looked up at Blackston. A slight frown came over his face. “You love me?” he asked her. “I do love you,” Blackston said, leaning in to give him a hug. Crumley served in the U.S. Army Air Corps from 1945 until 1948. He is a veteran of the Korean War. And he has earned medals and ribbons for his service. These days, though, the uniform is gone. He is one of 44 veterans that Blackston, a licensed practical nurse, takes care of in Unit 605 of the Richard M. Campbell Veterans Nursing Home. This is the floor where the veterans who suffer from advanced dementia live. Blackston has cared for veterans in this unit for 20 years. This year, she was named the South Carolina Health Care Association’s Nurse of the Year. 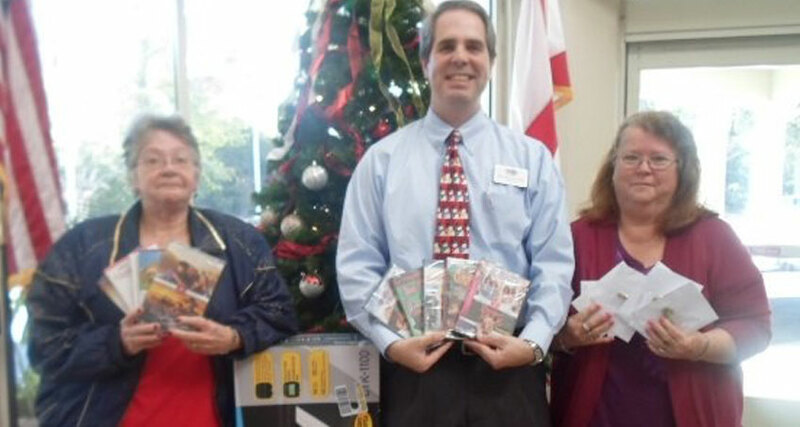 “Donna is the backbone of Unit 605 and is an absolute joy to work with,” the nursing home’s administrator, Greg Osborne, said. Osborne was the one who nominated Blackston for the award. She won for the nursing home and then garnered the top award for nursing facilities all across South Carolina. With her usual joking tone, Blackston, 63, laughs a little when she talks about the award. To Blackston, this is just what she does. She has been a nurse since she was a kid growing up in Cleveland, Ohio. She said she would treat and care for her dolls and any of her friends in her neighborhood. She had a toy doctor’s kit and a plastic stethoscope in those days. “In those days, your parents would send you outside and tell you not to come in until the streetlights came on,” Blackston said. The inclination to be a nurse or work in the medical profession was not something she inherited or picked up on from her parents. But it stuck, from her childhood all the way through to high school. She volunteered at the hospital in her community when she was old enough. And when she was 18 years old, and a high school graduate, she worked at a dry cleaner’s to pay for her tuition to the Parma School of Practical Nursing. Blackston graduated from the nursing program in 1969 and has been a nurse ever since. She has cared for elderly neighbors, raised six children and has 16 grandchildren. That was at home. At work, she cared for the patients at St. John’s Hospital in Cleveland before she moved south to Anderson County 35 years ago. She worked at AnMed Health, Medicus and another local nursing home before she came to Richard M. Campbell Nursing Home in 1993. And here, she found her home — a second family. To her and the staff on this unit, the men and women here could be their grandparents or parents. Blackston’s father, Martin O’Boyle, fought in World War II. He was a bomb detonator and served in France and Germany. He received a Purple Heart for his service. Here, in this unit, Blackston said she has met men who helped build the twin towers of the World Trade Center, learned stories of miraculous survival from veterans who were at Pearl Harbor when it was attacked, and has heard many a story from the battlefields of World War II. 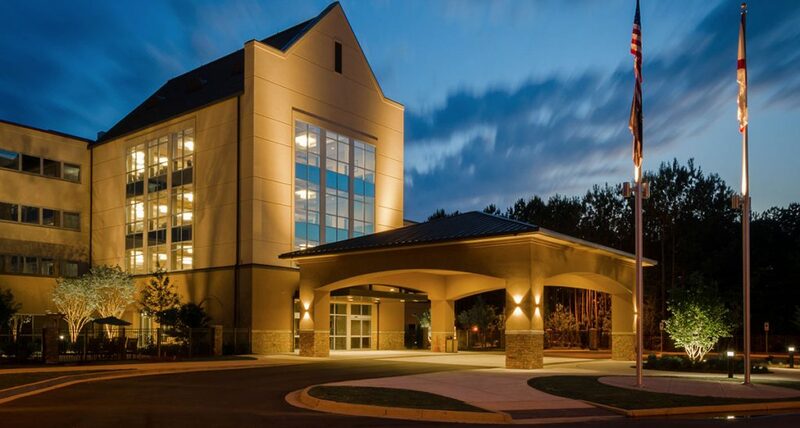 Alabama’s largest long-term care facility for veterans earned high marks during a recent inspection from the federal government. This accomplishment is even more significant considering that the facility opened just 14 months ago. 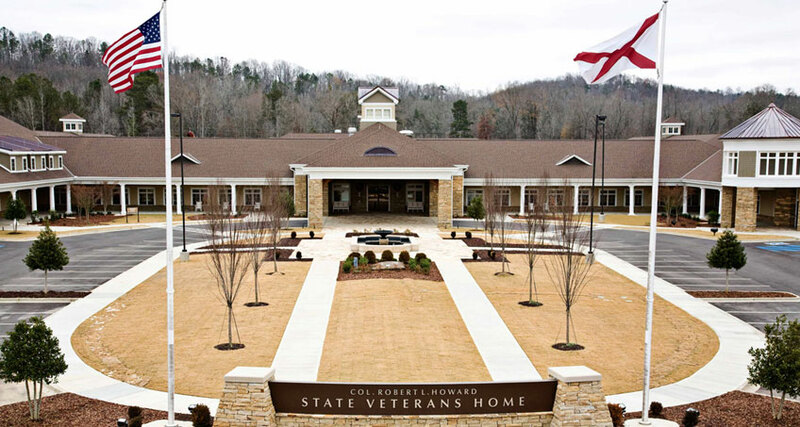 The Col. Robert L. Howard State Veterans Home (Howard VA Home), which opened in 2012, earned a deficiency free health survey from the U.S. Department of Veterans Affairs (VA). Just like other nursing homes, state veterans homes are surveyed or inspected annually by the Alabama Department of Public Health (ADPH). However, state veterans homes have the additional oversight of the VA. The VA measures a veterans home on 158 standards that are either met or not met. The VA inspection is always led by a team from a local VA hospital. For the Howard VA Home inspection, the team consisted of three people from the Birmingham Veterans Affairs Medical Center, and five people from Ascellon Corporation, a company which the VA contracts with to survey VA homes. The team spent four days inspecting every facet of care at the Howard VA Home before determining the facility met all 158 VA standards. State veterans homes date back to the post-Civil War era when many states created the homes to provide shelter to homeless and disabled veterans. 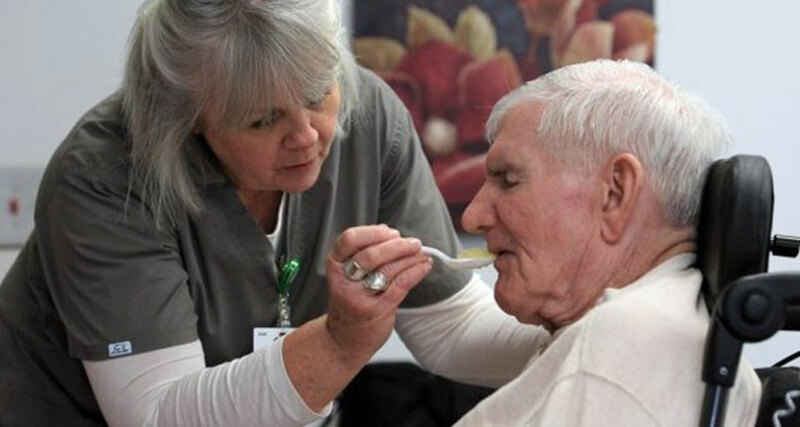 Like community nursing homes, state veterans homes are skilled nursing facilities designed and equipped to care for chronically ill patients who are no longer able to care for themselves. Where were you on September 01, 1939 when World War II started? …maybe not born yet? Do you remember what happened on April 30, 1975? That was the end of the Vietnam War. Almost everyone can remember the significance of September 11, 2001 and the terrorist attack on the United States. 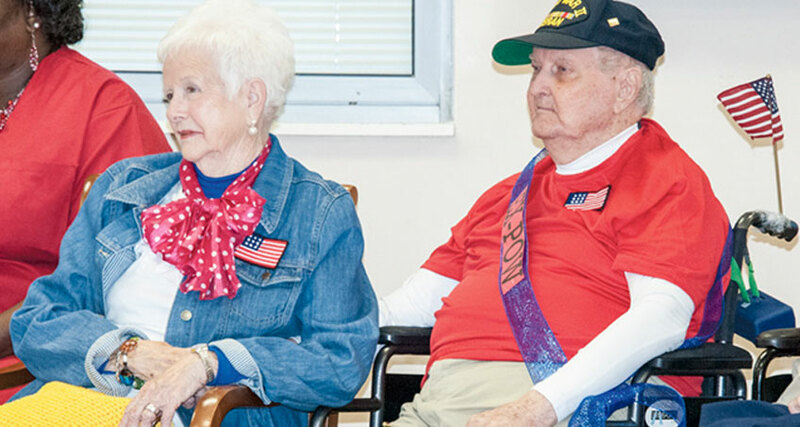 Some of the residents of Richard M. Campbell Veterans Nursing Home may not be up to speed on current events, but most can recite their branch of military service and their rank. 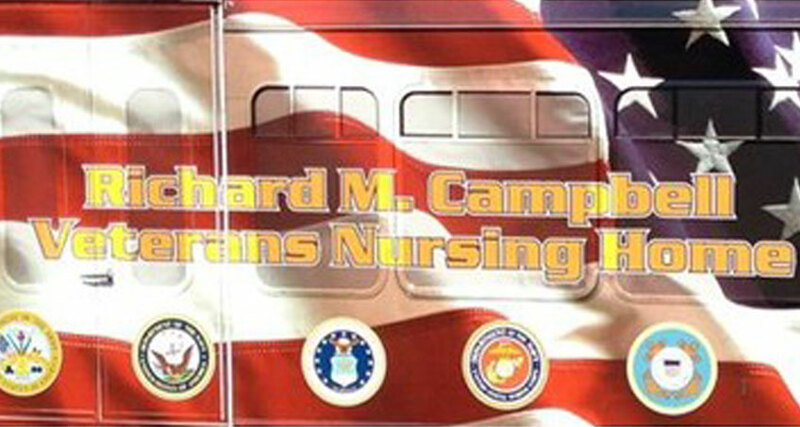 The mission statement for Richard M. Campbell Veterans Nursing Home is to honor the country’s commitment to care for its military men and women when they can no longer care for themselves. 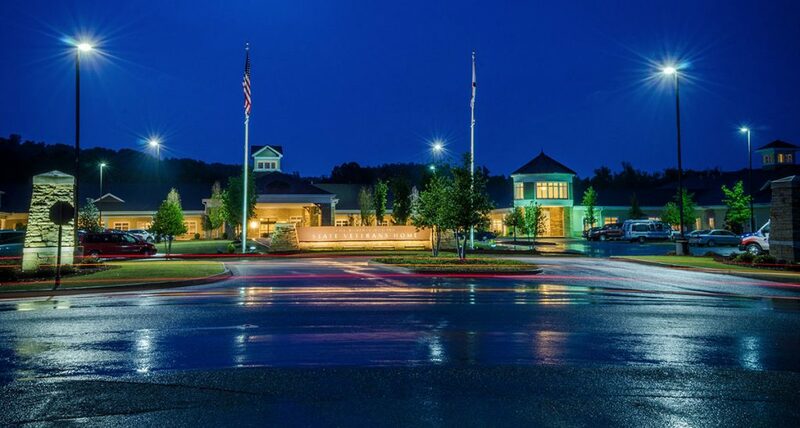 The facility houses 220 residents, including ten female veterans. Service pensions can offset the financial burden, but residents are responsible for the cost of their care. Just like any other nursing home, some residents have family members who visit often, while others are dropped off and essentially forgotten. Imagine sharing a bedroom with a total stranger. Imagine losing your privacy and your freedom. Imagine having to depend on someone else for every need. Along with the loss of independence comes the loss of individuality. For soldiers who take pride in their service to the country, life in a nursing home can be a harsh adjustment. The staff at Richard Campbell focuses on treating residents with respect and dignity as they transition to their new life. Sunday, November 03, marks the date of the seventh You Are Not Forgotten Run hosted by the Teufelshunde Motorcycle Club. The annual affair is more than a motorcycle ride. Bikers, passengers, and residents of Anderson County contribute cash and personal items such as socks, tissues, lotions, and the little things that most people take for granted. The first ride had twelve bikes, and this year’s event included more than one thousand bikers with spectators lining the streets of Anderson to watch the procession. Timms Harley Davidson, Holiday Church, and Bonitz Flooring Group are among the many sponsors. The ride is followed by sky diving and an afternoon military celebration. Simple acts of kindness reap priceless rewards. Warm socks on a cold night comfort more than feet. Sometimes it takes only a five minute phone call or a ten minute visit to help someone not feel forgotten or alone. Take a moment to thank a veteran.